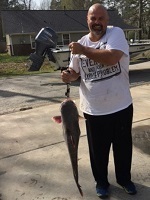 Superbowl Sunday 2-4-18 - Lake Houston Fishing! It has been over a month since I have been on the lake. Made it out there Sunday morning. 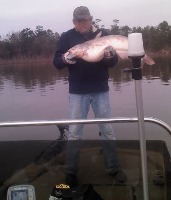 Water was higher than normal, clarity not bad for Lake Houston, 55 degrees. Around 8am a thick fog rolled in and I just knew the fish were about to start biting. One hour later the fog started to roll out and the fish did not start biting. Five hours out there netted me 8 fish. Not a great catch of fish, but was very nice to be out on the water. Sorry no pictures, I forgot. I will take some next time. Good Luck and great Fishing. Good to hear you were able to get out on the water Shane. I think once the water warms back up and stays no cooler than 60, the bite will pick up substantially.